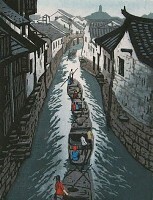 传记: His works have been shown on many important exhibitions at home and abroad and won many international prizes. He has held individual artwork exhibitons at Beijing, Taiwan, Hongkong and New York. In 1995, he was invited to Canada and American to hold art exhibitions.